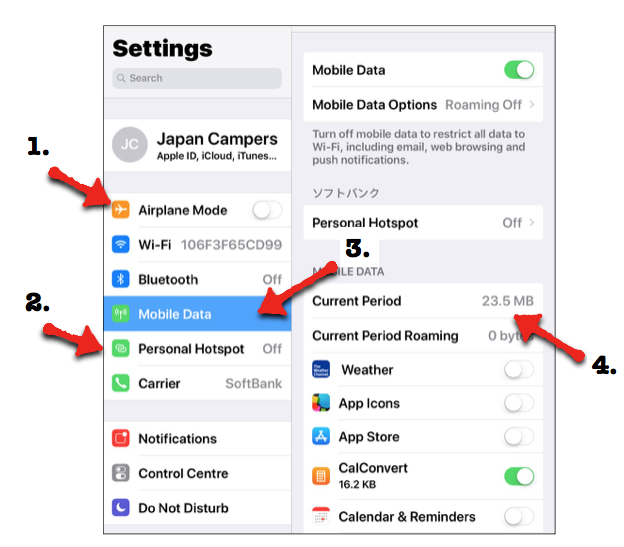 Here we collected few advices how to use the iPad with mobile data. Open Settings (bottom right corner at the main desktop). 1. Airplane Mode - to avoid unwanted data usage, turn on Airplane Mode when you stopped to use the iPad. Even if you're not using any application, the iPad takes still small amount of a data for system service. Especially in the night, turn it on to be sure that you'll save as much data as you can. 2. Personal Hotspot - you can easy connect your mobile to the iPad's Wi-Fi. We do recommend to log in to your private email accounts, bank accounts and social media from your own device using the iPad as a personal hotspot. We do not take any responsibility if you return the iPad without log out from your personal accounts. ​Be careful! It's very easy to lose your free data even in few hours if you'll forget to turn off your phone's automatic updates, notifications etc. 3. Mobile Data - turn on mobile data to have access to the Internet. In this section you can find a list of apps and choose which of them can have an access to the data. 4. Current Period - here you can check your data usage. JC staff will mark in the contract amount of the data which you start with and will let you know what is your free data limit.